Every week we pull together some great Canadian recipes from Canadian food bloggers around the web featuring one main ingredient or dish. Whether it's the dead of winter or a chilly, wet spring day nothing warms you up and makes you feel cozy like a hot drink. Here's some of our favourite hot drink recipes from Canadian food bloggers! One of the best parts of winter is knowing that it's so easy to curl up with a woolly, oversized sweater, fluffy socks, a good book and... a hot drink. With the elements safely kept at bay outside, whip up a batch of creamy hot chocolate, a spicy tea, some cinnamon infused apple juice or, maybe something a little more grown up with a splash of Scotch, Fire Cider or Bailey's! Whatever your taste, there's hot beverage here for every taste! A floral tisane with hibiscus and winter spice notes in this **[Spiced Hibiscus Tea](http://fromthelandweliveon.com/spiced-hibiscus-tea/)**. From **The Land We Live On**. A more adult pumpkin spice bevvie - **[Pumpkin Spiced Whiskey Hot Chocolate](http://www.spiceandsprout.com/recipe-blog/2016/9/13/pumpkin-spiced-whiskey-hot-chocolate)**. From **Spiced and Sprout**. 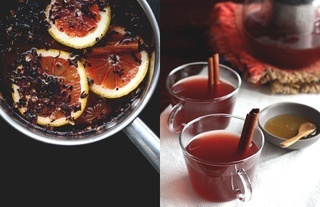 Add some kick to your hot toddy with this **[Fire Cider Hot Toddy](http://sheeats.ca/2015/11/wild-drinks-cocktails-fire-cider-hot-toddy/)** recipe. From **She Eats**. This **[Black Cherry Apple Cider](http://www.cookinginmygenes.com/black-cherry-apple-cider/)** is a great twist on traditional hot apple cider. From **Cooking In My Genes**. Make your own **[Masala Chai](http://theteacupoflife.com/2016/10/homemade-masala-chai.html)** at home! From **The Teacup of Life**. Make your morning cappuccino a little more Canadian with this autumn spiced **[Mappleccino](http://cinnamonandcoriander.com/en/spiced-mapleccino-der-cappuccino-mit-ahornsirup/)**! From **Cinnamon & Coriander**. The classic after dinner indulgence on a cold night: **[Bailey's Coffee](http://www.doitallworkingmom.com/2016/09/baileys-coffee.html)**. From **Do It All Working Mom**. Bring back some of the warmth of summer with this **[Lavender Latte](http://healthydelicious.ca/2016/03/10/lavender-latte/)**. From **Healthy Delicious**. Click the images to get the recipes! Kid Friendly Slow Cooker Wassail | Frugal Mom Eh! A big thank you to all our FBC Members who participated in this weekend's hot drinks recipe roundup. Thanks for taking part Maya!